Hec One Love is an abstract painter whose large-scale works reinvent action painting with a street aesthetic. His signature splatters and drips render color a palpable presence, while his bold use of aphorism in his Loveism Campaign subverts the omnipresence of iconic, commercial branding. 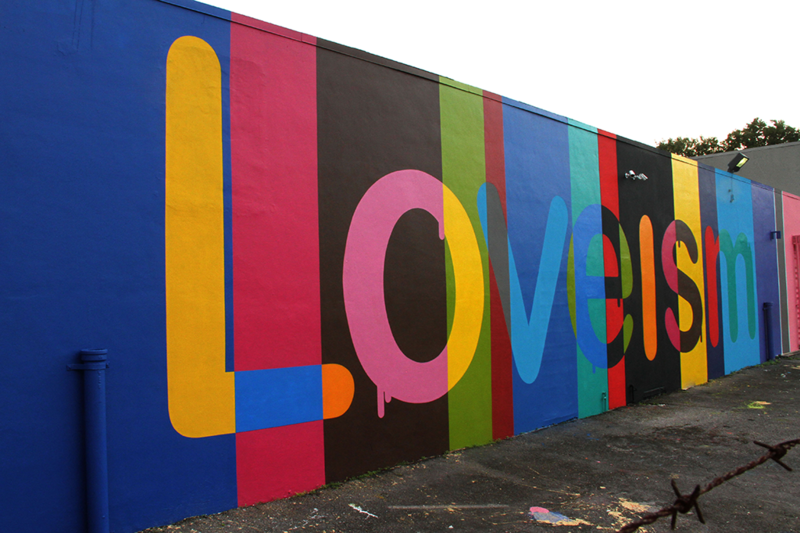 Hec One Love’s work can be seen on walls around South Florida, including the Wynwood Green at Armory Studios, Purvis Young Gallery, Product 81 Gallery in Wynwood Arts District and the Fat Village Arts District in Ft. Lauderdale. His iconic Hec One Love logo stickers can be seen throughout South Florida, across the United States, and Latin America. His work on canvas was shown at the NOW Contemporary Gallery in Wynwood in 2012. Hec curated a Miami Street Collective wall installation at Fountain Fair Miami for Art Basel 2012 and recently showed his new original works at the 69th Regiment Armory during NYC Art Week 2013 to celebrate the Armory Show Centennial. Born and raised in Havana’s Vedado neighborhood, Hec One Love’s childhood was rich in old books, art, and culture — but poor in everything else. As a child, he often painted the old faded buildings of Havana with his mind and brightening the grey urban landscape of 1970s Havana with his imagination. Emigrating to the United States in 1982, Hec quickly found himself deep within Miami’s still underground hip hop culture. Within a year, he was one of the first graffiti writers in South Florida. By 1986, he had established himself as a leader of the Miami graffiti movement: he founded TWB (Together We Bomb) and MOB (Masters of Bombing) crews and co-founded Alive5 crew. He initiated Miami’s original Wall of Fame and was one of three Miami teenagers selected for a graffiti exhibit at the West Dade Regional Public County Library. His “Pink MOB” piece in South Beach, from 1988, was featured in a two-page spread in New American Street Art, Beyond Graffiti (SOHO BOOKS, 1998). His gun and can toting character from 1987 made the cover of Miami Graffiti Art (SCHIFFER, 2014) while his pieces from the eighties were also heavily featured inside the book. Many more photos of his early street work were collected by fans, later to be disseminated through historical graffiti internet sites such as MiamiGraffiti.com where he is cited by other well known Miami graffiti pioneers. Hec studied graphic design at International Fine Arts College, and worked in commercial design throughout the 1990s. He founded his own web design firm in the early 2000s. By mid-decade, he returned to the streets, at first doing more traditional graffiti pieces, and then developing his current large-scale unique abstract style.